Home security is the foremost protection to safeguard your family and valuable assets. Have you ever had someone break into your house? Hopefully not. I have heard enough life-threatening stories of burglars broke into the house that filled everyone with horror. On one hand, as the first line of defense, key-and-lock is the simplest form of security that hasn’t been changed since decades ago. Believe it or not, an experienced locksmith can unlock your door in seconds, literally. So, In this review article, we are going to take you through a new smart lock project called KeyWe on Kickstarter. And ultimately, we will discuss the flaws, potential risk, compare a similar product and explain the things which you need to be noted before buying. We have heard of a smart lock before and it’s not new, but why KeyWe? 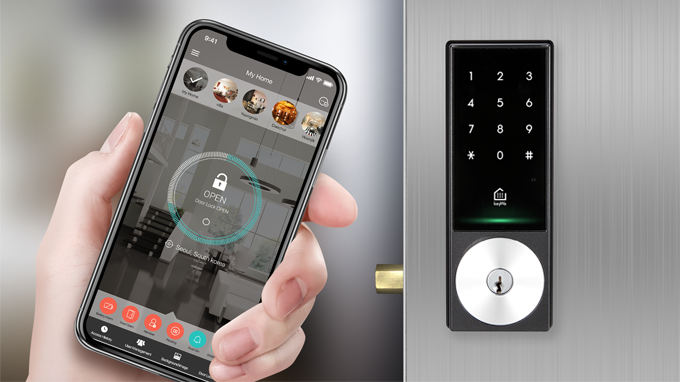 KeyWe offers a combination of desirable features in this one little device, including the guest key, one-time passcode, Bluetooth/Z-wave/WiFi-bridge connection, fake passcode, Alexa integration, NFC and more. With that being said, let’s move on to the next section. Review and Discussion — Is KeyWe worth it? You may have noticed that there have been quite a lot of Smart Lock in the market already, but mostly failed. So, why did so many Smart Lock fail? It’s because there are many unexpected things happened in both the software and hardware, and people are generally having a higher expectation and low tolerance towards the system errors. It all goes back to a simple question — how to expect a system which can’t even guarantee a solid result to safeguard the user’s house? That said, the so far best-in-class is this one by Schlage. Not perfect of course, but people are satisfied with the overall performance. Very often, a big worry is the ability to take on a hit by force and element. Although there is a short GIF clip shows that this Korea-made lock is so strong that it can get run over by a car and still in one piece, you might be more concerned about the ability to withstand the harsh elements. The creator has claimed that KeyWe is able to withstand temperature differences of -22ºF to 122ºF (30ºC – 50ºC) and resistant to light water, such as light rain and water splashes. Also, it is certified with ANSI Grade 2 Deadbolt. Well, at this point however, there is nothing conclusive can be drawn until we got the KeyWe on hand. As addressed by backer Eli, the concern is understandable. Replacing battery is a big hassle and it can’t be helped. Most smart lock uses the replaceable battery power that lasts for months before the replacement. Likewise to KeyWe, it uses 4x AA battery which provides up to a year of power, ideally. Also, you will receive an app notification when the battery went low. Certainly, the duration is depending on the battery quality and also the elemental strike (such as high temperature) which will reduce the lifespan of the battery. As for me, this is the part where I find it annoying. Having to worry about the battery and thinking about when I might get locked out of the door is entirely not entertaining. KeyWe is currently supporting the Google Home and Alexa. However, it doesn’t support Apple HomeKit for now due to the fact that the “special chip” which required by Apple is expensive. Another thing to be noted is the Google Home doesn’t allow users to voice command to “unlock” the door for security reason. Users often complaints about the smart lock unable to lock properly and require a perfect alignment of the stepper. For example, you can tell from these many negative reviews of the August Smart Lock regarding the weak motor which couldn’t supply enough torque. For that, KeyWe has introduced 3 line of defenses — The “locked” sounds made after a successful locking to make sure your door is locked, Secondly, KeyWe uses 2 motors for a stronger stepper force, and lastly, the door has an internal sensor which will detect and send you an app notification if it’s not properly locked. I am surprised that KeyWe team is very thoughtful when designing the product. Another cool feature to prevent other (such as your guest and delivery guy) knowing your passcode even if they standing next to you and watching you type-in the passcode. This optional feature can be toggled off in the app, it allows you to mask the passcode disregard any digit you enter before the correct one, but the last 4 digits must be correct. Watch here for fake passcode demo. While this feature is helpful, but it’s not unbeatable as if someone already knew this trick, and they reverse the process by only memorizing the last 4 digits. So the best practice is to change your passcode from time to time, or use a certain set of passcode throughout the time/day/month for extra safety. By default, you will need to connect to Bluetooth to unlock the door. As we know, Bluetooth has a limited range of distance (98 ft) where it will not work if you’re out of range. For remotely control of the smart lock, you will need either z-wave hub or Wifi Bridge. Z-wave hub, like smartthings or Wink, is a smart hub to connect your personal home assistant (Google Home and Alexa) to the other smart home appliances. If you don’t have a home assistant, it’s fine, you’ll just need to get yourself a WiFi bridge which serves as an intermediate to place at home (to connect to KeyWe via Bluetooth), and reach to your mobile phone (KeyWe app) via WiFi. So you might be asking, why KeyWe don’t just connect to WiFi instead? That would be more straightforward. And yes, it’s possible. The problem is the WiFi connection consume way more electricity than the low energy Bluetooth, this may result in battery replacement once every few weeks. Yes, all electrical appliances can’t fight a blackout. Just like you, I too worried if I would get locked in/out of my home during a blackout. They’re providing a physical key is what in your mind right? For sure it is, however, due to the fact that people often relying too much on the technology and couldn’t remember where the key was kept a few month/year ago. Luckily, you’d still have a few options left. KeyWe is operated by AA batteries, so you can use your mobile phone to connect to KeyWe via Bluetooth to unlock the door. Alternatively, create a guest passcode and send to your friends/guest/family via SMS. For the color finish, KeyWe is offering only 1 color finish at the moment. In overall, is KeyWe worth it? Yes, it sure worth a try and the price is reasonable. The creators seem committed to the project, quick and accurate response, and all the information provided are transparent and traceable, including the provided reseller list of their previous product. Just before you proceed, we have something to tell you. While the smart lock is convenient, it’s not perfect as there are always tons of complaints following it. Even the renowned smart lock can’t be avoided. The potential problems come along with the technology, to name a few, it includes picking up your neighbor z-wave, system malfunction/failure, element hit, issues after the operating system update, phones got lost (intentionally stolen and gets into your house) and the list goes on. While it’s advised to prepare yourself a spare key for the unexpected scenarios, if you’d have to always bring a spare key with you just to cope with the system failure, why bother to install the “not so smart” lock at the first place? Last but not least, smartlock can often be hacked pretty easily, watch this video. Anyway, you will be the judge, if you would still like to support KeyWe, feel free to grab a discounted one via the link below to Kickstarter. This campaign (and offers) will end by Fri, July 20 2018. This Korea-made smart lock is real smart.